20070822 - cleaning the crawlspace - IMG_3289 - bags of wires everywhere! With the construction ending FINALLY, and Carolyn finishing up the painting, she realized the crawlspace was a mess and so she decided to get our spare cables organized. The clear plastic comfortor bgas, with zippers, are the absolute best thing to store large collections of cables in. Medium collections store best in large ziplock bags. Cable types are sorted into labeled bags. It was crazy, but it was worth it because it was much easier to find everything after it was all organized. 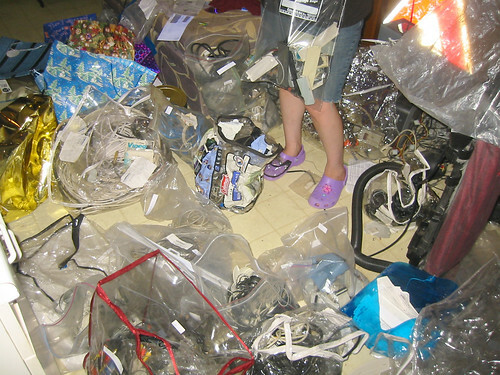 And it was surprising how many cables we'd pulled from the crawlspace within the next 6 months -- a few of these bags hung out upstairs near the end of 2007, due to the ever-changing setup with our new upstairs hangout area. Crocs, cables, plastic bag, wires. Clint and Carolyn's house, Alexandria, Virginia.